Q: How does an effective hair growth formula work? The correct formula holds the key to success. The formula should not just be filled with ingredients that only look good on the label, but rather with ingredients that have been clinically proven effective and are backed by scientific research for optimum results. The formula should address both hair growth and hair loss, working on dual fronts to ensure that the body is well equipped to fight hair loss by balancing hormone levels and other associated elements. It should also provide key nutrients to help stimulate renewed hair growth. Hair loss and its causes differ among individuals. Hair loss can be attributed to a variety of reasons some of these include hormonal fluctuations, spikes in stress and vitamin deficiencies to name but a few. Male sufferers of baldness generally inherit hair follicles that have a genetic sensitivity or predisposition to dihydrotestosterone (DHT), which shrink over time reducing the healthy lifespan of those hair follicles affected. In the end, these affected follicles stop producing healthy hair. The most sensitive areas affected include the temples and mid-anterior scalp, which is indicative of the horseshoe pattern of many bald men. Female baldness has different causes including pregnancy, post pregnancy and menopause. An effective supplement should contain key minerals, vitamins and amino acids that address the root causes, as well as, provide the nutrients needed to strengthen the body to boost new, healthy hair growth. Q: Do all hair growth formulas work? Unfortunately, this is not always the case. There are many shady companies that just go along with the latest health supplement trends formulating supplements that contain incorrect ingredients and wrong potency or amounts. Often, they even add unnecessary inactive ingredients or cheap fillers, binders, hormones, artificial colorings and preservatives that can hinder the effects of the active ingredients. Q: What are Important points to look out for? • It should contain key clinically proven ingredients to provide a total care solution to reduce hair loss as well as, stimulate regrowth. • It should contain key clinically proven ingredients such as biotin, tocopheryl acetate and folic acid. • It must not contain any fillers, binders or any artificial ingredients or colorings. • It must be 100% pure and natural with no unnecessary ingredients that might reduce the overall effectiveness of the product. The formula must provide a dual-action benefit for reducing hair loss, as well as, stimulating new hair growth. Q: Are there any known side effects to look out for? Of course each product is different, so it is always wise to read the label thoroughly and follow the manufacturer’s instructions carefully. Our research analyzed many natural ingredients and products, that generally do not present any side effects if used correctly. However, as with any supplement, we recommend consulting with a doctor if you are pregnant, breastfeeding, have an existing medical condition or taking regular medication. Q: What are the dosage instructions for hair supplements? Again, this differs between products. Always read the label thoroughly and follow the manufacturer’s instructions carefully, if you exceed the suggested dosage you could pose health risks to yourself. Generally, we found that most products suggest taking 2 capsules per day. Some people like to take the complete daily serving together at once, but we recommend spacing it out to achieve optimal benefits from the ingredients contained within the formula. Some consumers, experience positive effects within as little as a week. Whilst, for others, it can take longer. Everybody is different. Results will vary depending on other factors such as the type of diet you consume, lifestyle choices and genetic disposition. There were many manufacturers that offered refunds should you not get the results that you are looking for. Such a guarantee, shows the manufacturer’s confidence in its products and the results they predict you will achieve. Q: What should I expect to pay for a good hair growth supplement? The costs of products varies between manufacturers. Unfortunately, many are cheap, useless supplements that have been formulated without any science-based evidence behind them. Some of these companies are selling their products for over $100 per bottle, which is much too expensive. On average, the best supplements we found are selling between the $40-$50 price range. Often, when products appear cheaper, this is indicative of low quality or a low recommended daily serving, which will not bring the results you are looking for. Be aware. Read the labels. Q: Which hair growth supplement is the best one to buy? As each person’s experience of a product is different, it is difficult to say specifically which one is the best. That said, based on several factors, we did like Hairprin. 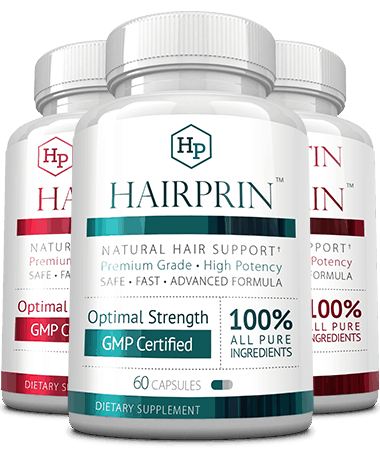 We found, that from the 50+ products that we analyzed, Hairprin had the best quality of ingredients, potency and strength, consumer feedback and the manufacturer’s customer service. Of course, it is ultimately your choice. We hope that or research has gone some way in helping you make your choice. If you are looking for a well researched product that brings effective results, we think that you can’t go far wrong with Hairprin. It is an excellent quality product, with great reviews and is well priced.